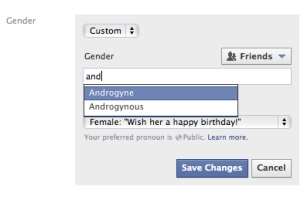 Last week, Facebook announced that its users would be able to pick genders from a custom list, instead of choosing either “male” or “female,” like they did before. With the list being so long, it seems strange that Facebook didn’t just give users the opportunity to type in their genders themselves. In some ways, this would seem much more sensible — if the “custom” option was completely custom, the social network could never be accused of neglecting or excluding anybody. But that would also open the gender field up for abuse, with users typing offensive or transphobic comments in the box. It would be naive to assume that wouldn’t happen — because, inevitably, it would. It seems that the decision to use a list was a wise one, and by enlisting the help of various LGBT (lesbian, gay, bisexual, and transgender) organizations to build it, Facebook did as much as possible to make this work. There’s also the option to choose which pronoun, out of “he,” “she,” and “their” users would prefer to be referred to as on the site. What really remains to be seen, though, is how this will affect Facebook targeted ads. Are users identifying themselves as one of the custom genders now free from gender-specific advertisements, and, if so, what will they have to deal with instead? Readers: Let us know what you think!